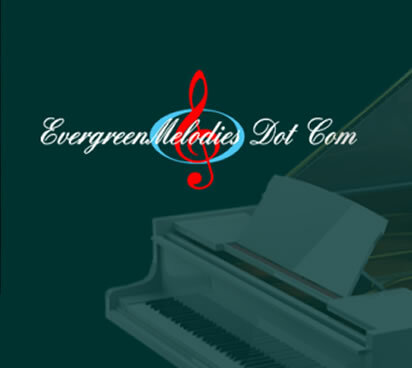 We meet many interesting people doing some very interesting things while trading John's piano music around the world on the web. Three ladies who managed to capture our attention are, Sharon, Josie and Joyce from Rehoboth Beach, Delaware, USA. 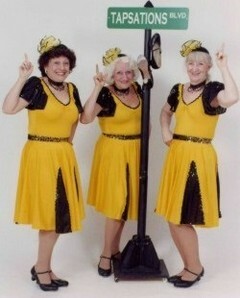 Known as 'The Tapsations!' 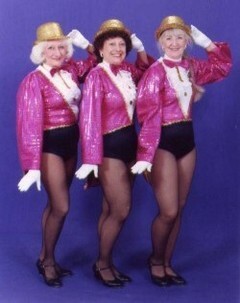 , these three formed a Senior Tap Dancing Team associated with the Cape Henlopen Senior Center in Rehoboth Beach, Delaware. These enthusiastic ladies share a true passion for tap dancing, displayed by the complex, quick-paced tap routines they choreograph and skillfully perform. They are dedicated to lengthy rehearsals each week with a vision to carry on the tradition and legacy of tap dance. Tap dancing doesn't just come from their feet; it comes from within their hearts. They entertain every month for audiences at Retirement Communities, Nursing Homes, Volunteer & Service Organizations, Local Events and Anniversary Celebrations. These talented Senior Tap Dancers have made over 35 appearances in the past 12 months, including Ocean City, Maryland's "Dancing till Christmas Revue" and as the entertainment for the Eastern Star's 75th Anniversary Banquet in Baltimore, MD. Their upbeat 60-minute show, complete with male soloist and master of ceremonies, changes every 4 –6 weeks and consists of exciting tap dances, familiar songs, humor, colorful costumes, original choreography and audience participation. Their enthusiasm shines brighter than the sequins on their costumes. It is for this reason that they have adopted this motto, "You don't stop Tap Dancing because you grow old, you grow old because you stop Tap Dancing." The Tapsations now proudly tap dance to John's Sidney's beautiful piano music during some of their performances, since many of the songs he plays are well known and loved by the Nursing Home residents everywhere they perform. We certainly have enjoyed getting to know these three rather special ladies since they discovered us at Evergreenmelodies Dot Com. Their dedication to their performances is admirable. We found their story very interesting, definitely worthy of a mention in our news. Well done ladies. Keep up the good work.